If you’re looking for a live edge table, you’re in the right place. We specialise in creating striking centre-pieces that fully utilise and celebrate the unique curve of the tree from which they’re crafted. Every table is made to order so you can have the exact size and style that you’re after. Watch our short video here to find out more. The live edge that you see is the outside curve of the tree trunk. It’s carefully worked back by hand to remove the loose bark and soft sapwood, leaving the smooth, tactile natural waney edge that makes each table so unique, and is so irresistible and satisfying to touch. These trees are grown in sustainably managed forests, and are well pruned and maintained with the scraggly lower branches being removed. As a result they grow taller and straighter that they’re wild-grown brother and sister counterparts. It’s these trees that make the best looking and most useable live-edge tables, as there’s not too much variation in width across the slabs, and the natural curve of the edge is subtle and stylish. What Causes Warping, Twisting, And Cracking? 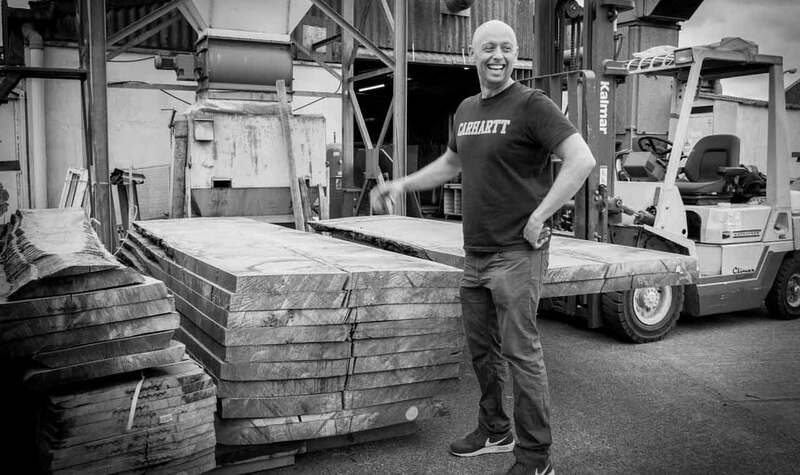 One of the things that causes timber to twist and warp as it dries out, is how evenly it dries. Timber that’s full of knots is often very uneven in density so as it dries out can be very prone to movement issue like twisting and warping. Using a higher grade of oak that’s more uniform in density, and that can be properly kiln dried without falling apart will result in a more stable and less problematic piece of furniture. 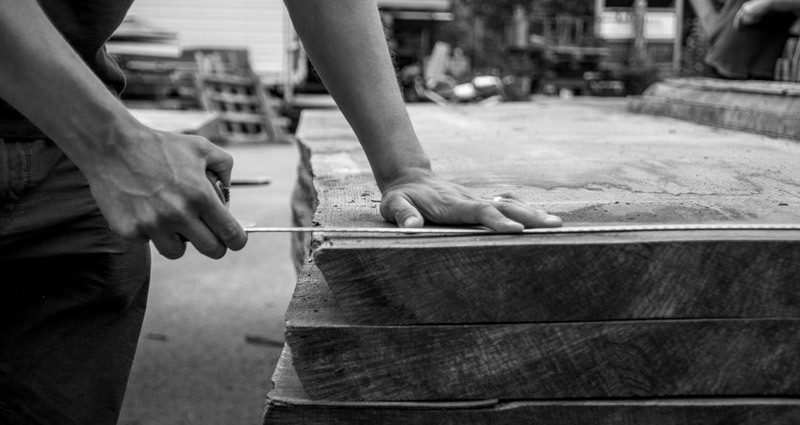 The oak grade we tend to tend to use most is light character grade (specifically QB1 grade) , as it has beautiful natural grain pattens and is also very consistent in density, so is perfect for making high quality live edge tables. What Is A Book-Matched Table? A book-matched is perfect if you want huge, thick, heavy slabs of timber that have a mirrored grain pattern and natural edge contours. 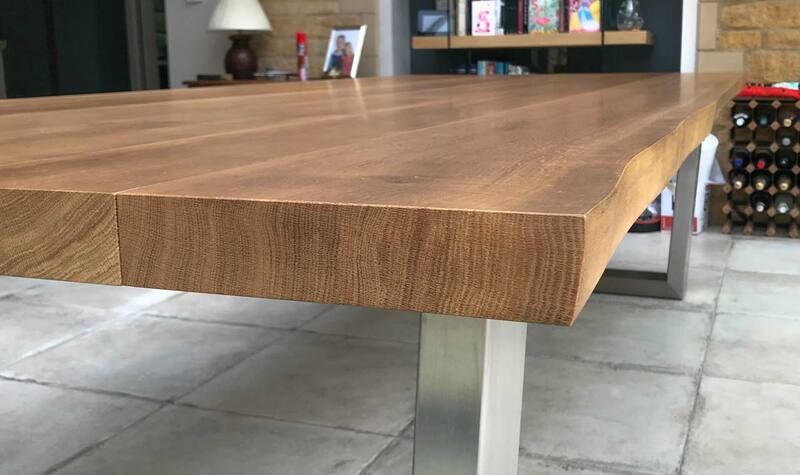 To make this style of table top we use two consecutive slices from the same tree, folding them out like a book (hence the term ‘book-matched’), before working each piece by hand to reveal the striking and awesome natural presence of each piece. 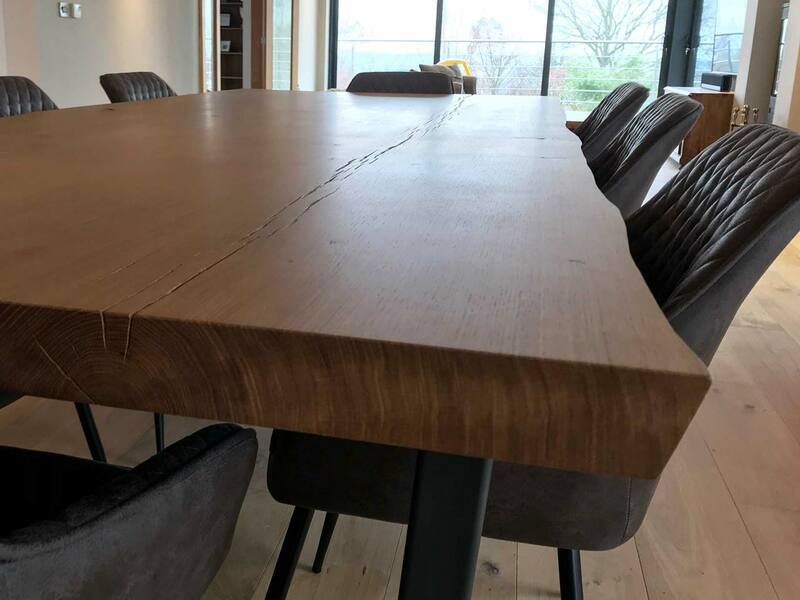 For these massive book-matched table tops we use the entire width of the widest part of the tree, so selecting the right trees that have a consistently high quality is very important. We’re also incredibly careful (and a bit obsessive!) 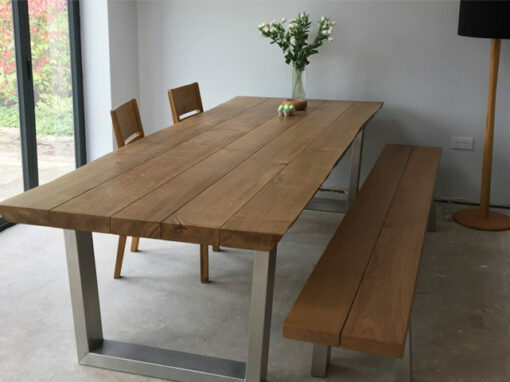 when selecting the timber we use for these large waney edge dining tables. 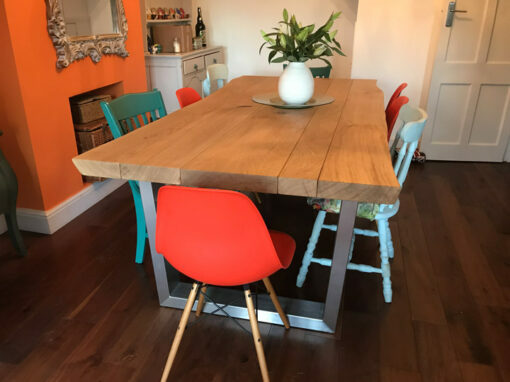 Our specially engineered free-moving joints connects the table top to the legs in a way that allows the table to breath as it acclimatises to your home. Every one of our tables comes with Abacus Aftercare. 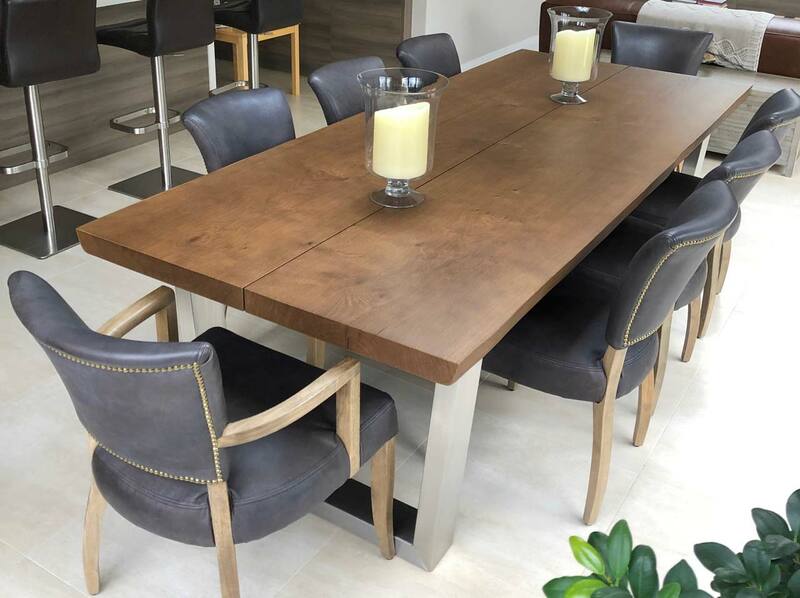 When investing in a live edge dining table like this, it’s vitally important that the person or company selling it are willing to stand by their product. They must be willing as well as have the knowledge to correct any visual or structural issues that result from settling movement. And it needs to be done right to ensure your table’s longevity. 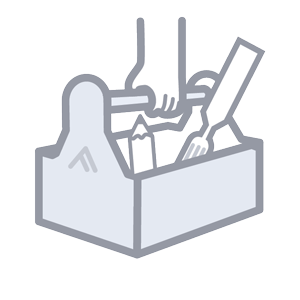 Our dedicates and skilled Abacus Aftercare team provide a nationwide service, and are well equipped and experienced to deal with any potential issues you might have. 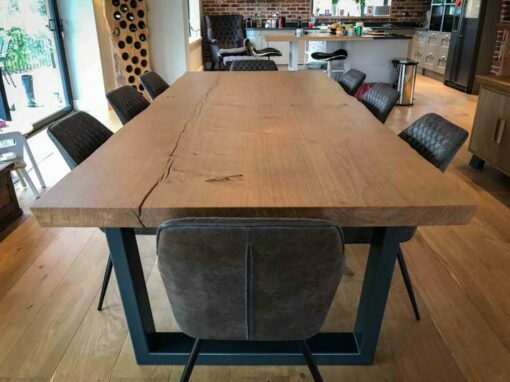 2800mm x 1200mm x 750mm / 65mm thick, live edge / smoked oak finish/ single slab oak top / Anthracite Grey powder coat base. 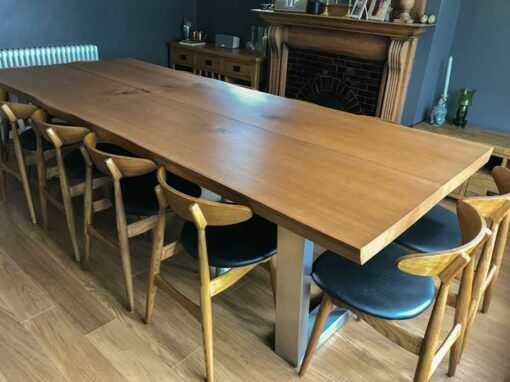 For the dining table, the main centre-piece of the room, our client wanted a real show-stopper: a huge single-piece oak top measuring 2800 x 1200mm, 65mm thick with a live edge. 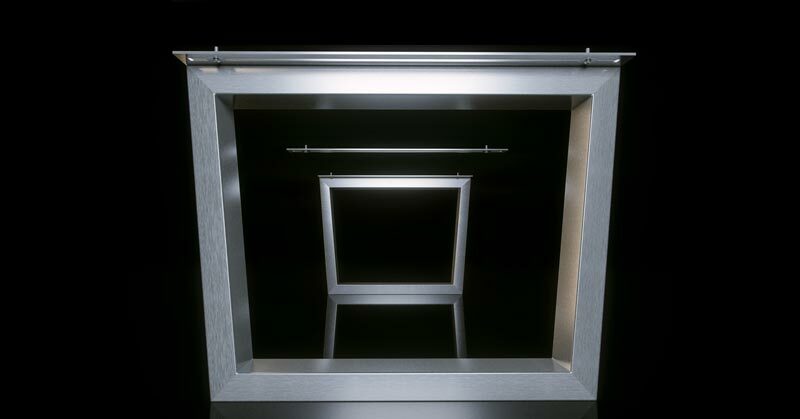 In particular he wanted the top jointed make a seamless top surface, exhibiting as much natural character as possible. We made this top from 2 pieces of the same tree for the best possible match of colouring and grain pattern, and we hand-finished the cracks to show the natural character as close as possible to the raw natural state of the French Oak tree. 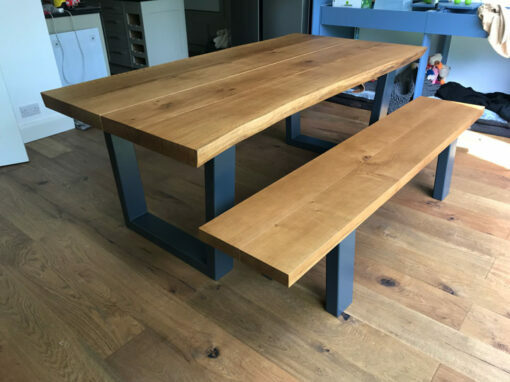 The finish is Smoked Oak with Anthracite Grey legs. It took 4 of us to install the top, but it really is a spectacular piece to which these photos don’t quite do justice. The brief for this table was to create a striking centre-piece for a newly renovated open living space. The table was to be made form two book-matched oak slabs, and have a subtle live natural edge, so timber selection was very important. With the dark Antic finish and brushed stainless steel legs, the table compliments the space very well and we’re happy to report that the customer was thrilled. 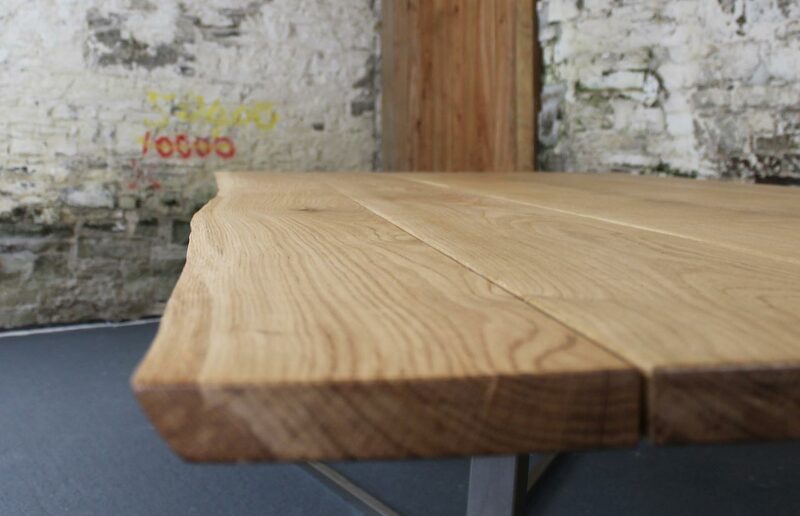 2700mm x 1100mm x 750mm / 65mm thick / Live edge oak top / Antic finish / book-matched oak top / brushed stainless steel legs. 2000mm x 1000mm x 750mm / 65mm thick / Live edge / smoked oak finish/ plank style oak top / Anthracite Grey powder coat base. 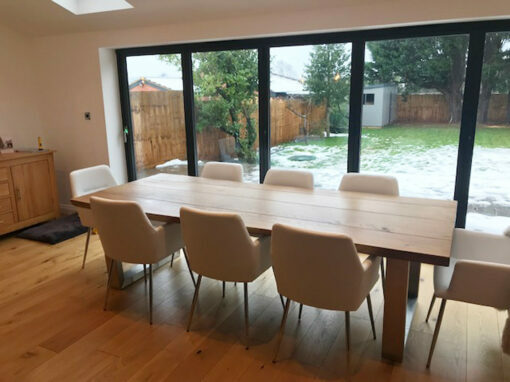 As the finishing touch to an extensive open plan living space, his Komodo table and bench set were colour matched to the frames of the patio doors. The bench seating was chosen to suit the informal and busy family area that would be used for every meal of the day. 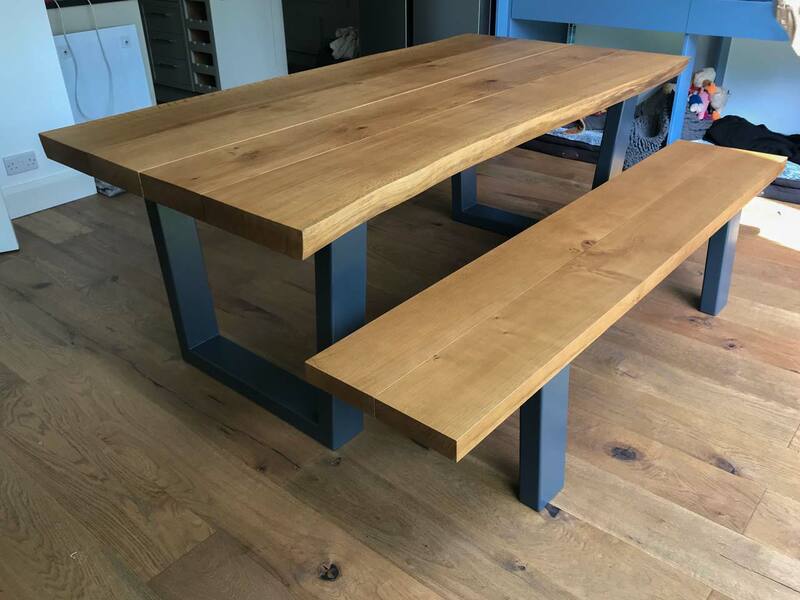 The table and matching bench combination works well for informal settings, and is also a great way to maximise seating space and squeeze a few extra diners at the table occasionally if needed.